Welcome to my day to share on the Quilt Qwazy Queens Blog Hop to help celebrate Worldwide Quilting Day. Big thanks to Marian at Seams to Be Sew for hosting this annual event. 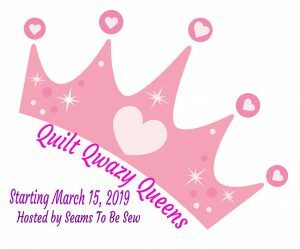 I just loved the name of this blog hop, Quilt Qwazy Queens, mainly because I AM a Crazy Quilter, in addition to sane quilting. When I initially started blogging in 2006, I had 2 blogs, one for sane quilting and this one for my crazy quilting projects, hence the name Karrin's Crazy World. I eventually just started blogging on this one for everything. When I started thinking about the Quilt Qwazy Queens blog hop, I immediately thought of finishing one of my crazy quilt UFO's (which are many). At one time, I was active in Crazy Quilting International, and took place in multiple round robin type projects. You would decide upon a theme, a coordinator would send out a list of 5 other participants, and you would send your blocks a participant on the list, they would embellish it, and send it on to the next person. You would get back 5 embellished blocks, you would embellish your block, and hopefully finish your project. I chose one of my unfinished projects which was a wool block, in which I made wool baskets and the other participants embellished them. These were the other 5 participants' blocks. This was my block, started but not finished. I got to work embroidering some flowers. My plan all along had been to set these baskets on point, so I went looking through fabric, and I had less than 1/2 yard of this linen-type fabric and hoped I could fussy-cut a few of these flowers, and have setting triangles to finish this project. With the poor light recently due to raining days, I didn't realize till I got it pretty much together that the background was dark navy blue not black. This was all I had leftover of that fabric. I quilted/outlined the flowers/leaves on the linen type fabric. Other than that, I just outlined the basket blocks. My block is the second row, left side. On the right side is Cathy's block at Cathy's Crazy by Design. And label with the group of participants. This project had participants from Japan, Finland, Japan, 2 from California and one from Utah. They all did such lovely work and I will cherish this project. I thought I would share a few of my other Cwazy projects. A CQ vest. This was another round robin I was in. We sent around vest fronts and participants worked on them. This was an under the sea theme. This was a jewelry roll to use when I travel. This is the front. And lastly, I was privileged to take 2 crazy quilting classes from Judith Baker Montano at Empty Spools in Asilomar, CA. One of the classes was a CQ landscape class. A year or so after the class, Judith contacted participants in those two classes and asked if they had their projects finished to be able to appear in her upcoming Fibre Art Montage Book that was about to come out. I was able to put the finishing touches on my project and was able to appear on page 158 of her book! This is the rest of the schedule for today: Be sure and stop by and check out everyone's projects. There are also prizes to be won – two $35 gift vouchers from the Fat Quarter Shop – you can enter here and see the full list of participants. Thanks so much Marian at Seams to be Sew for this Quilt Qwazy Blog Hop! Your projects are all lovely! Your fiber art montage is amazing and it's so wonderful that it was included in a book! Great projects and such treasures! Congrats on being in the book, great project. I am really enjoying this blog hop - all of the "crazy" projects are inspiring. Thanks! Those baskets are just amazing. What a labor of love. Fun qwazy quilt vest too. Oh those things we just love to do! Love the baskets and your lovely projects. What an honor to have your project in Judith Montano's book! Thank you for sharing! Oh the baskets are stunning. Your hand work skills are amazing. Thanks for sharing. Those are lovely! Grats of the book. very creative crazy quilt projects. Your Qwazies are absolutely incredible! Thank you for sharing and congratulations on being included in her book. Your landscape is so beautiful. You stay quite busy! I love the fiber art project! Loving that landscape quilt especially - gorgeous! I like all your projects. Wow, what awesome handwork! The embellishing you do is just marvelous. Thanks so much for sharing! I ooooood and ahhhhhh at your landscape. I love your baskets quilt! What a nice project, Karrin! I love it! How great to have your project included in a book! Thanks for sharing! Love your embellishment work! Great projects & Thanks for sharing! I love your flower work on the wool basket block! Great projects. I love the lighthouse. We went to visit a few lighthouses on vacation a few years ago. I took a lot of pictures in hopes of doing a quilt someday. congratulations on the book. Your landscape quilt is just beautiful. Congratulations on being featured in her book. It turned out wonderful. Love the look. How cool to have your quilt in a book!! It's wonderful!! I've never done a crazy quilt...I don't like hand work, so I'll just admire yours!! Lovely CQs. I have never tried it. Thanks for sharing. Very creative pieces. Much fancier than anything I do. Such wonderful projects. I have enjoyed myself participating in round robbins some I've had great experiences with others led me to decide to never participate again in them... all in all tho they can be really fun. I would have enjoyed a crazy block round robin back in the day when I could still use my hands to embroider with as I truly loved to embroider, my favorite stitch was the Brazilian rose... and I'm thinking I saw some of those in one of your baskets... not an easy stitch to learn but so worth it when you do learn it. I loved having you be part of QQQ 2019 and hope I see you in more blog hops in the future.